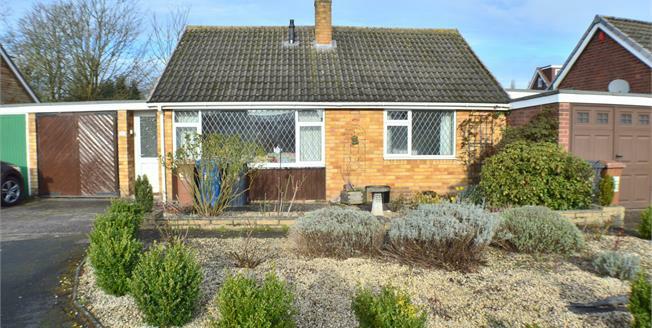 An impressive 2 bedroom link detached bungalow with garage in a quiet residential location off Ferndale Road occupying a private easy maintenance garden plot which is complemented by a garden room/conservatory. The smartly presented interior is well appointed throughout providing 888 sq ft floor area and features a welcoming reception hall with built in cloaks cupboard, a spacious lounge/dining room with feature fireplace, contemporary style re-fitted kitchen, garden room/conservatory with double French doors opening onto rear garden. Inner hall 2 double bedrooms both with built in double wardrobes, re-fitted shower room. Outside there is a private easy maintenance rear garden, a single garage with useful storage area to rear, well stocked front garden and driveway. NO CHAIN.